Our premium pet boarding facility in Parker, CO and maximum fun await your furry best friend. Our Dog and Cat Boarding guests enjoy loving attention and plenty of time to romp and play with friends. We have the most fun, secure and industry-leading dog daycare space for lucky dogs. Our play areas are continuously monitored by our passionate, highly trained staff for safety and fun. 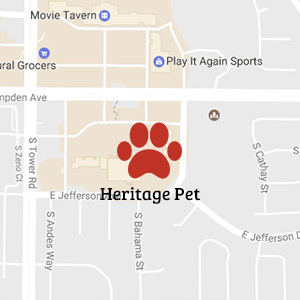 Heritage Pet provides the area's most award-winning, professional dog grooming service for all breeds at our Aurora and Parker salons. We even provide mobile grooming serving the greater Denver area to come to you! We can help with many of the most common dog behavioral issues as well as basic and advanced obedience training. Give us a call to learn more about out about our professional dog training classes. 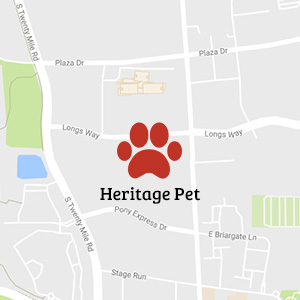 Heritage Pet provides high-quality dog grooming, pet boarding, dog daycare, and dog training services. We have two convenient locations to serve you - our Full Service Pet Resort in Parker, CO and our Grooming Salon in Aurora, CO.
With over 20 years in business, many of our clients are like family. Our clients’ dogs and cats feel like they belong to us too, and we look forward to seeing them each time they make a reservation. If this is the kind of place you want to bring your pet for pet grooming, dog daycare, pet boarding, or dog training, we look forward to meeting you and your pet.